Have you ever wondered if the products "as seen on TV" really work? I usually don't fall for the gimicky things that are sold on t.v., but my hubby really, really, wanted to try these "Eggies." When I saw them in the dollar store, I thought, "Why not? It would be a good experiment to try." 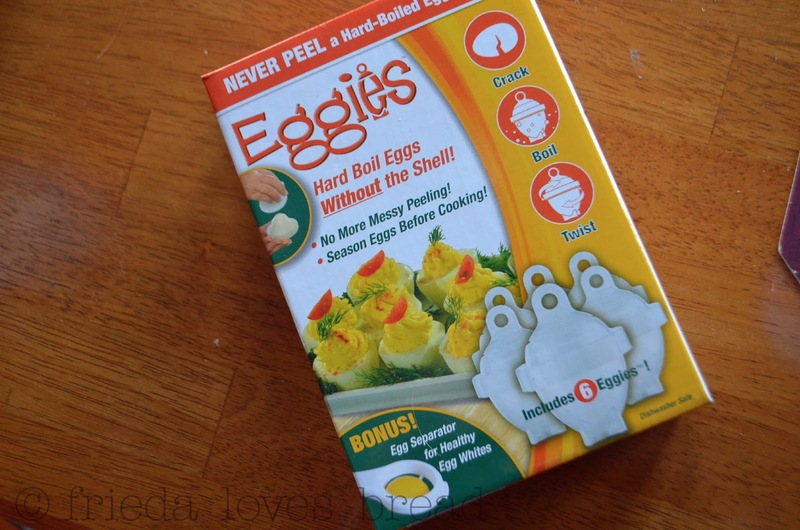 Hey, the package says it all ~ "Crack, Boil, and Twist....Never Peel a Hard-Boiled Egg Again!" 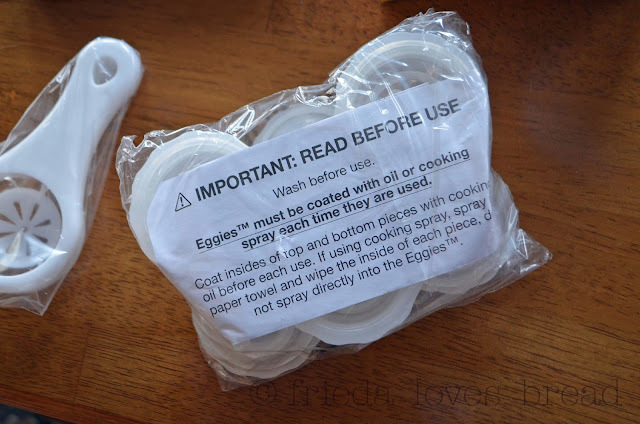 Out of the package, I read that Eggies must be coated with oil or cooking spray. Looking at the pictures outside of the box, I realized my mistake. The collar goes on first, then the egg, then the top. 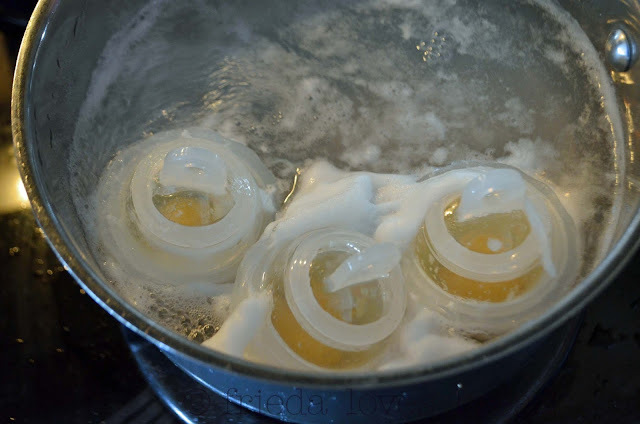 I made sure everything was screwed together tightly and put three Eggies in a pot of warm water, to bring to a boil. Ughhh. I even tried another batch of eggs, making sure the collars were screwed on tightly. Same leaky, messy results. 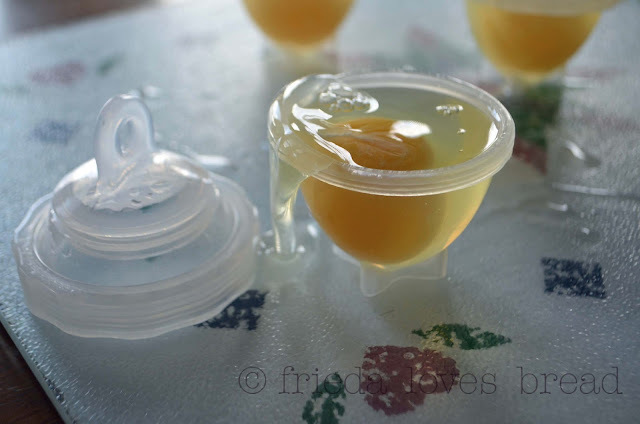 Here are the Eggies, simmered covered, for 10 minutes and cooled for 3, with the tops unscrewed. I was not happy with the taste of the yolk. It was dry and almost rubbery. My guess is that either too much of the egg whites leaked out or the Eggies somehow allow moisture to cook out, leaving the yolks dry and rubbery tasting. I would not serve these eggs at all. 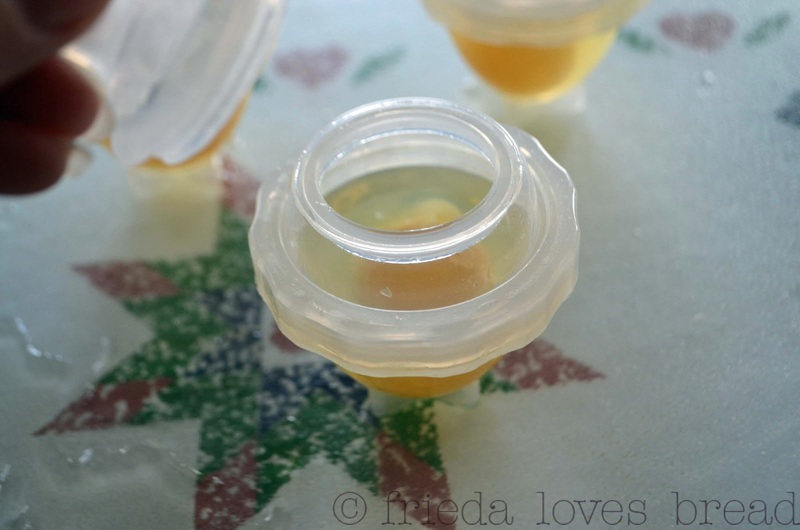 I think the time spent oiling the Eggies, cleaning up the leaky mess it leaves behind, and the taste gives this a big thumbs down. 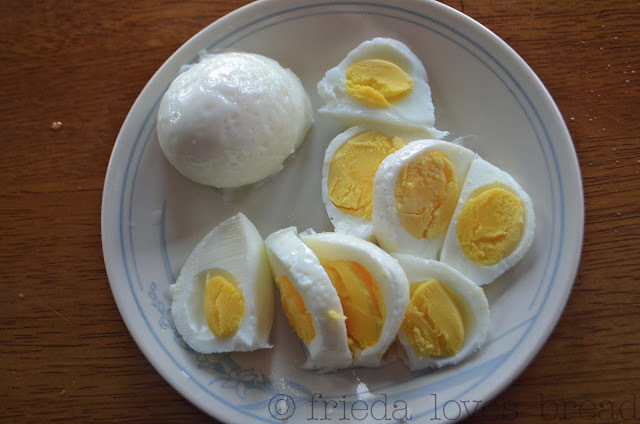 I prefer my Perfectly Peeled Hard Boiled egg recipe: simply plop whole, uncracked eggs into a pot of water, boil them, set them in an ice bath and boil them for 1 minute longer to release the membrane from the shell, making the eggs easier to peel. 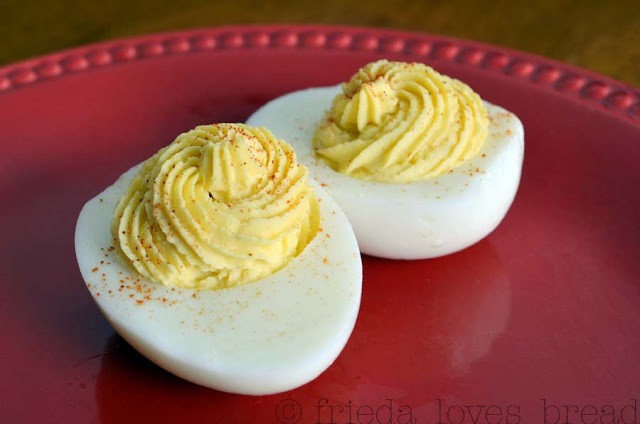 Besides, don't these Deviled Eggs look pretty and pretty darn tasty? $170 Yikes! I haven't seen that commercial, but I'll tell you, it is a challenge to get the dough just right for ANY pasta extruder. Too doughy and it'll clog up the machine, too crumbly, and it will fall apart. I save money and stress by purchasing macaroni and all the other fun shaped pasta. If you want to make pasta, invest in an Atlas pasta roller. You can make lasagne, fettuccine, and angel hair pasta that is SO easy to make! You must be like me...I have to see a picture to understand! I do this process with REAL eggs. 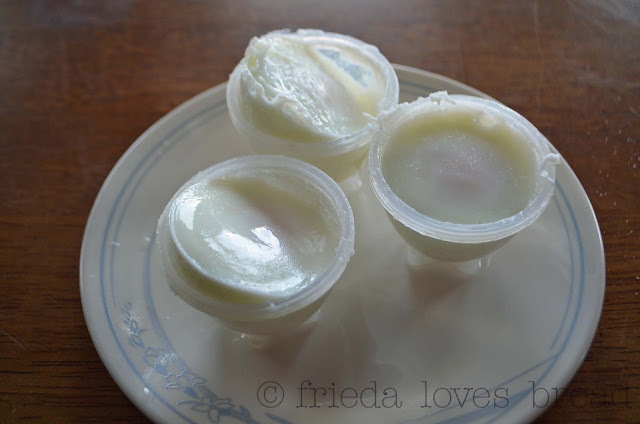 I use a slotted spoon or sieve to get the boiled eggs into the ice bath and while they are sitting there, I bring the hot water back up to boiling. You can see the process here (http://www.friedalovesbread.com/2010/06/perfectly-peeled-hard-boiled-eggs.html) or click on the link at the bottom of the post. yeah, I think I'll pass on those Eggies. Thanks for posting. I always wonder about those "as seen on tv" items. Sounds like this one is a complete dud and waste of time. But I got a good laugh out of it!